If you're in the market for wireless earbuds, now is a great time to snag a pair at a huge discount. Samsung has its Gear Icon X Bluetooth earbuds for $49 after a massive $150 discount. The Gear Icon X earn solid praise for a stellar design and snug fit. And for Bluetooth earbuds, a snug fit is essential, since you won't have any wires to keep them from falling to the ground or worse. The Gear Icon X earbuds offer more than just a wireless connection to your phone for listening to music. They come with 4GB of built-in storage, so you can load up some tunes and go for a run without needing to even bring your phone. For extra sporty people, they're even water resistant and can measure your heart rate and send that data to your phone's activity-tracking apps. With a battery life between two and four hours, these headphones are ready for most workouts, commutes, or walks. And they come with a charging dock that can recharge them twice if you're on the go and away from power. 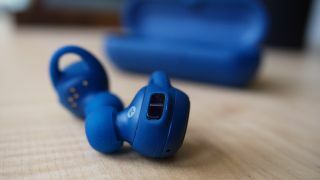 The normal high price of $199 stood out as a detractor for these earbuds in the past, but at $49, they are a much more attractive offering. The blue Gear Icon X model appears to have already sold out on Samsung's website, so the black and white models may be heading that direction as well.